British Athletics has announced that the SPAR British Athletics Indoor Championships will be streamed live via both www.britishathletics.org.uk and the BBC Sport website today Saturday 9th and tomorrow Sunday 10th February. 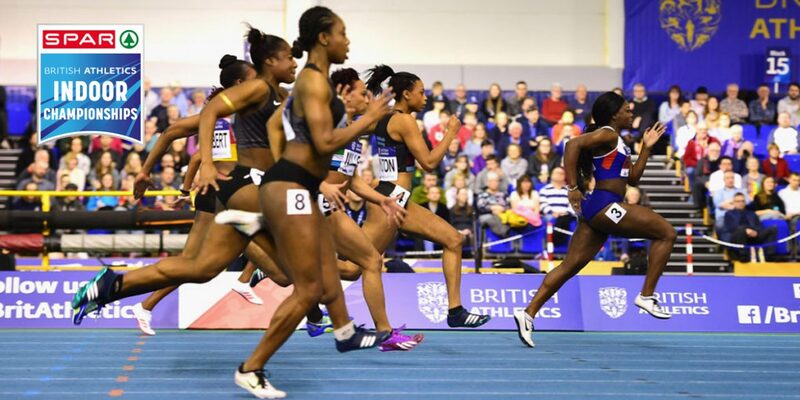 The event takes place at Arena Birmingham, and will feature many of the country’s best athletes as they battle it out for a place on the British Athletics team at the European Indoor Championships in Glasgow on 1-3 March, as well as the honour of being crowned British champion. Both days of the championships will be shown live on the British Athletics website, with BBC Sport also broadcasting the stream via their ‘live’ section of the BBC website. Live commentary will be provided by Kris Temple and six-time international 800m medallist Jenny Meadows, with Women In World Athletics commentary competition winner Katie Hamilton providing supporting commentary alongside the pair over the weekend. Middle distance and multi-international medallist Laura Muir (coach: Andy Young, club: Dundee Hawkhill), world 4x100m champion and European 200m silver medallist Nethaneel Mitchell-Blake (Lance Brauman, Newham & Essex Beagles) and Commonwealth heptathlon champion and European silver medallistKatarina Johnson-Thompson (Bertrand Valcin, Liverpool Harriers) will be among the star attractions in Birmingham this weekend. Reigning European Indoor champions Richard Kilty (Benke Blomkvist, Middlesbrough) and Asha Philip (Steve Fudge, Newham Essex & Beagles) will both be in attendance as they bid to top the podium and secure team spots, with the likes of 2018 world indoor medallists Eilidh Doyle (Brian Doyle; Pitreavie) and Shelayna Oskan-Clarke (Jon Bigg, Windsor Slough Eton & Hounslow) also present and bidding for gold in their respective events, the women’s 400m and 800m. Tipped to be the ‘race of the championships’ by the current British indoor record holder Jenny Meadows, the women’s 800m is also set to feature the likes of Oskan-Clarke, Lynsey Sharp (Terrance Mahon, Edinburgh), Adelle Tracey (Craig Winrow, Guildford & Godalming) and Mhairi Hendry (William Parker, Victoria Park City of Glasgow) and has the makings of a hugely competitive final. Field action sees the likes of double world and Paralympic champion Aled Davies (Ryan Spencer-Jones, Cardiff) and European finalist Naomi Ogbeta (Tom Cullen, Trafford) feature in the shot put and triple jump respectively, while recently crowned European bronze medallist Holly Bradshaw (Scott Simpson, Blackburn Harriers)enters the championships in buoyant mood and in search of her first indoor pole vault title since 2013 following a strong winter. British Athletics Major Events Director Cherry Alexander said: “On the back of the success, great viewing figures and average watch time we saw last year’s stream achieve on both our website www.britishathletics.org.uk and BBC Sport, we are delighted that we can offer this service once again to anyone who isn’t able to make it to Arena Birmingham this weekend.